There are some drawbacks in above discussed magneto ignition system. Firstly, the contact breaker points will wear out or burn when it is operated with heavy current. Secondly, the contact breaker is only a mechanical device which cannot operate precisely at high speed due to the dwell period which is not sufficient for building up the magnetic. field to its full value at that particular speed. The conventional contact breaker can give satisfactory performance only about 400 sparks per second which limits the engine speed. At low speeds, relatively high current is drawn from the battery due to the contacts remaining closed for longer time. Thus, the system becomes inefficient at low speeds. The disadvantages of the convention contact breaker assisted ignition system can be completely eliminated by the use of electronic controlled ignition system using contactless triggers to give timing system. The basic difference between contact point’ and electronic ignition systems is in the primary circuit. In the contact breaker system, the primary circuit is opened and closed by the electronic control unit shown in Figure 2.35. The secondary circuits are practically similar to previous systems. In the secondary circuit, the distributor, ignition coil and wiring are altered to handle the higher voltage that the electronic ignition system produces. The high voltage (about 47,OOO volts ) has the advantage that the spark plugs with wider gaps can be used. It results a longer spark which can ignite lean air-fuel mixture. As a result, engines can run on lean mixture for better fuel economy. 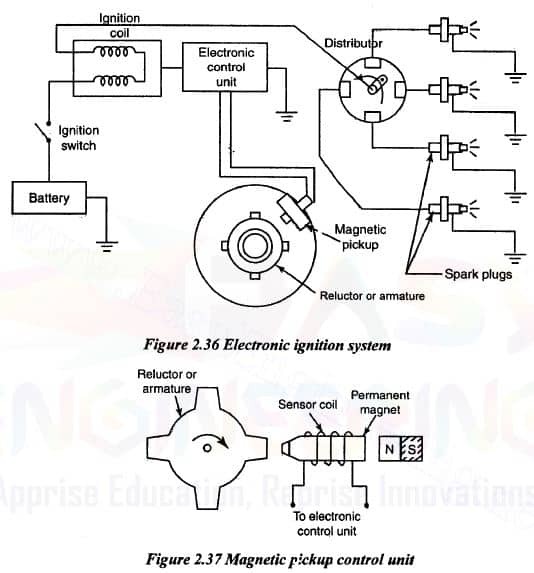 A schematic diagram of an electronic ignition system is shown in Figure 2.36. It consist of a battery, ignition switch, electronic control unit, magnetic pick-up, reluctor or armature, ignition coil, distributor and spark plugs. The construction of battery, ignition switch. ignition coil, distributor and spark plug is similar to previous methods. In this system, a magnetic pickup is used instead of contact breaks points in a conventional system. Also a cam is replaced by a reluctor or armature. The magnetic pick-up is shown in Figure 2.37. It consists of a sensor coil through which the magnetic flux is generated by a permanent magnet. A star shaped rotor called reluctor or armature is mounted on the distributor shaft which modulates the flux density in the coil and induced voltage in the coil due to the consequent changes in the flux. This voltage serves as a trigger signal for the high voltage generator circuit. Since there is one spark plug per cylinder, the number of teeth of armature is equal to the number of engine cylinders. When the ignition switch is closed (i.e. switch is ‘ON’ . ), the reluctor rotates which makes the teeth of the reluctor cone closer to the permanent magnet. It reduces the air gap between reluctor tooth and sensor coil. Thus, the reluctor provides a path for the magnetic lines from the magnet. The magnetic field is passed on to the pick up every time when the reluctor teeth pass the pickup coil in which an electric pulse is generated. This small current then triggers the electronic control unit which stops the flow of battery current to the ignition coil. The magnetic field in the primary winding collapses and the high voltage is generated: in the secondary winding. It led to spark in a spark plug via distributor. Meanwhile, the reluctor ,teeth pass past the pickup coil. Therefore, the pulse unit is ended. It causes the electronic control unit to close the primary circuit. 1. The parts such as reluctor, magnetic pickup and electronic control module are not subjected to wear as in case of a mechanical contact breaker. 2. Periodic adjustment of engine timing is not necessary. 3. It gives very accurate control of timing.